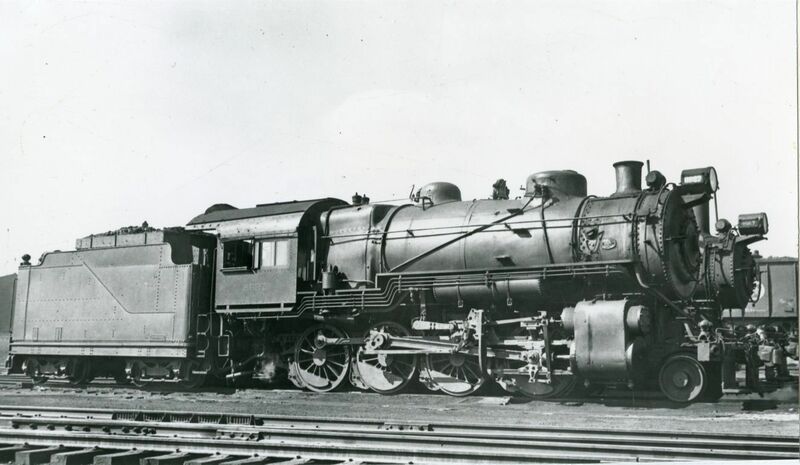 The PRR H8, H9, and H10 classes of 2-8-0 "Consolidation" locomotives were very similar, other than for the cylinder bore sizes (24" for the H8, 25" for the H9, and 26" for the H10). The H8 was introduced in 1907 and built until 1913, at which point production shifted to the H9 and H10 classes. The H9 was built until 1914 and the H10 was built until 1916. There were about 480 class H8, 274 class H9, and 273 class H10 locomotives manufactured. All of these engines had 62" drivers (33" pilot wheels), Walschaerts valve gear, piston valves, and a Belpaire firebox with 55.2sqft of grate area. Unless one can see the builder's plate, it is impossible to tell, externally, to which class a particular locomotive belongs. The locomotive measured 36'1" long and the tender measured 29'10", for a combined total of coupled-length of 66'.